Hoddesdon has an unusual combination of late mediaeval and stark 20th century architecture. A short walk along Lord Street leads from the High Leigh Conference Centre into the centre of Hoddesdon. On the way into Hoddesdon, Lord Street is lined with engaging examples of Victorian and early 20th century housing. But Tower Heights in the centre of the town is one of the ugly examples of late 20th century tower blocks. 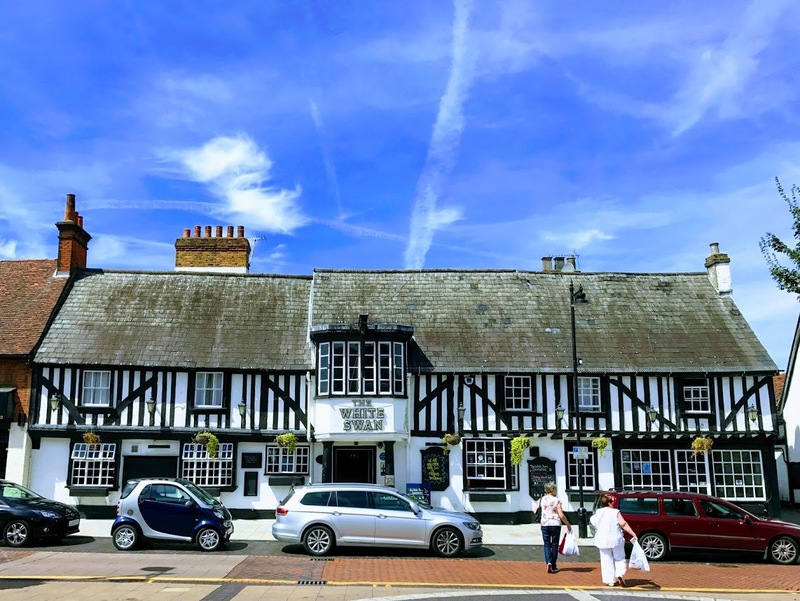 Yet, Hoddesdon has a number of interesting and historical listed buildings, including Rawdon House and Rathmore House, and late mediaeval public houses such as the White Swan, King William IV and the Star. Close to High Leigh, the King William IV at No 197 Lord Street is a 17th century timber-framed building, with modern brick and roughcast walls, and an old tile roof. 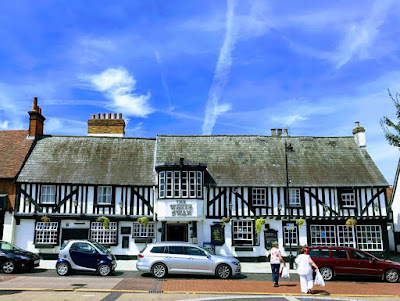 The White Swan was once described by the architectural historian Sir Nikolaus Pevsner as ‘visually the most striking timber-framed inn’ in this part of Hertfordshire and Essex, and it has been an old favourite of mine since I first took part in a conference in High Leigh in 2006. But I also wrote about the Star just two years ago [20 July 2015], following the discovery of a series of 16th century wall paintings of ‘national importance,’ which were uncovered in September 2014. The Tudor-era paintings, located on plasterwork the north wall of the bar, depict half-figures and biblical verses. The architects believed there might be more images on other walls and began further investigations as well as examining further details found on one of the beams supporting the ceiling. The paintings depict fascinating examples of Elizabethan clothing and millinery and exhibit a high level of technique. At the time, it was said discoveries of this quality are extremely rare and that the implications for art history give them national importance. The paintings had been hidden behind panelling for hundreds of years in the pub originally known as the Lyon and later as the Salisbury Arms. Today this is the Star, and it is just three or four doors further along the High Street from the White House. When I walked into Hoddesdon from High Leigh yesterday [18 July 2017] to buy The Guardian, I also stopped at the Star, next door to the local newsagent, to admire ‘The Willow Arch,’ a new sculptural work by the local contemporary Basketmaker and Willow Artist, Hazel Godfrey. Hazel Godfrey makes her sculptural work using natural materials, primarily willow. She is committed to an ethos of sustainability and manages her own willow plantation in North Hertfordshire, which provides for the mainstay of her weaving, although she also uses other natural materials such as cane, bark, leaves and found items. Hazel was born and raised in Hertfordshire and studied for an honours BA in Applied Arts at the University of Hertfordshire. She has been a practising artist since 2008, when her work formed the centrepiece of a Gold Award winning stand at the Chelsea Flower Show. On her Facebook page, Hazel says she is inspired by nature and loves working with natural materials. Her work is in private collections and gardens, nature reserves, community spaces and schools throughout Britain. Hazel takes part in Herts Open Studios annually and is a member of Herts Visual Arts, Hertfordshire Basketry, and the National Basketmakers’ Association. She is involved annually with the arts side of the Rhythms of the World music festival in Hitchin. More recently, she led the county basketry group in making work to celebrate Luton’s involvement in the Olympics. Today [19 July 2017] is the last day of USPG’s annual conference in High Leigh. Last night, the skies broke, and Hoddesdon was covered by a lengthy and heavy thunderstorm. I may not be walking into Hoddesdon this morning to buy the paper, but it was inspiring yesterday to see a new work of art that was connected with nature in this part of England. I've just come across your blog post about the willow sculpture I made for The Star at Hoddesdon. I would just like to say a big "thank you" for your write-up and promotion of my artwork. I love the picture you have taken and would be delighted if you would allow me to use this image for my portfolio (whilst crediting the photography to you of course).